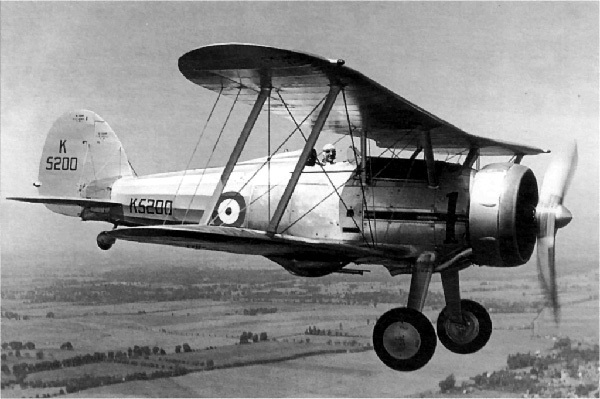 The Gloster S.S.37, which would become the Gladiator, made its inaugural flight on September 12, 1934 and it was the last biplane fighter operated by the RAF. It was the last of three biplanes to see operational service in the war, the others being the Fiat C.R.42 Falco and the Polikarpov I-15. It replaced the aging Bristol Bulldog and played an interim role until the arrival of the Hawker Hurricane and Supermarine Spitfire. It was also the first fighter with an enclosed cockpit operated by the RAF. • Top speed of at least 250 mph (400 km/h). • Armament of four machine-guns. • Ability to operate as a day or night fighter. • To be powered by the Rolls-Royce Goshawk engine. Although specifications called for the aircraft to be powered by the troublesome and vulnerable steam-cooled Goshawk engine, this engine was never perfected, because of its weight and complexity, and the first Gladiator (S.S.37) was powered by a 645 hp (480 kW) Bristol Mercury VIS2 engine. During trials, it achieved a maximum speed of 253 mph (405 km/h). The final Gladiator design would retain the tail, fuselage and engine of the earlier Gloster Gauntlet (S.S.19B), but the wings would only have one bay instead of two. The landing gear would be internally sprung and the armament would consist of two Vickers guns in the fuselage, supplemented by two Lewis guns mounted under the lower wing. The only modern system on the Gladiator was the hydraulically controlled flaps. The Air Ministry would take control of the airplane on April 3, 1935 and it was assigned serial number K5200. 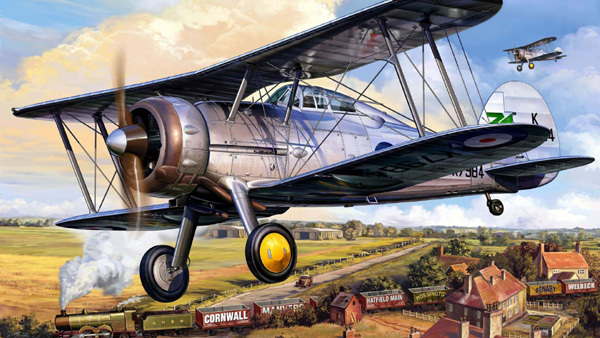 In July, twenty-three aircraft were ordered to meet specification F.14/35 and the name Gladiator was officially adopted. This was five years after the original specification was issued and in less than one year, the first Spitfire would take flight in March 1936. The fact that the Gladiator was able to meet the required maximum speed came as a surprise to military officials. Conventional wisdom at the time called for using liquid-cooled engines which allowed a more streamlined profile. Despite the increased frontal area of radial engines, they were lighter than cast block engines and as propellers became more efficient, switching from wood to metal, and horsepower increased, the engine profile became less of a factor. Other fighters would later arrive with large radial engines, such as the P-47 Thunderbolt and Focke-Wulf 190 and become some of best fighters of the war. Prototype K5200 without the enclosed cockpit that became standard on the Gladiator I. The Gladiator II was built to meet specification F.36/37 and the engine was upgraded to an 840 hp (625 kW) Bristol Mercury VIII or VIIIAS. The performance was the same as the Mercury IX, but it had an automatic mixture control, a Hobson control box, an electric start was provided from the cockpit, a Vokes air cleaner and sand excluder for desert operations. A vacuum pump was installed to operate a Sperry directional gyro, artificial horizon, and a Reid and Sigrist turn and bank indicator. Other instruments installed were an airspeed indicator, a Hughes rate-of-climb indicator, and Kollsman altimeter. The original armament called for four guns where the breech was within reach of the pilot, but this configuration was never implemented and two remote Lewis guns were located below the lower wing. The Vickers was notorious for jamming and all the guns were eventually replaced with Brownings. The first aircraft to be fitted with factory installed Brownings was the seventy-first and previous aircraft were retroactively fitted as the guns became available. The first Brownings were reserved for the Hawker Hurricane. In February 1937, Squadron No. 72 at Tangmere was the first unit to be equipped with the type followed by Squadron No. 3 at Kenley replacing Bulldogs. Other squadrons to receive the Gladiator were the 6, 25, 33, 46, 54, 56, 65, 72, 73, 79, 80, 85, 87, 94, 112, 127, 141, 152, 247, 262, 263, 521, 602, 603, 605, 607 and 615. The Carrier-based Sea Gladiators were more successful than land versions, but the Gladiator performed well in North Africa and against Italian opposition which included the Fiat CR.42 Falco. In October 1937, the Chinese Central Government ordered 36 Gladiator Is and this group would claim the first victory of World War II against Japan. International regulations forbade the assembly of combat aircraft in either country in Hong Kong, and the crated airplanes were shipped to Canton. The first plane to be shot down by a Gladiator was a Mitsubishi A5M Claude navy fighter on February 24, 1938 in the Nanking area by Chinese-American Capt. John Wong Sun-Shui, nicknamed 'Buffalo'. He was the first American fighter ace of the Second World War and was among 15 Chinese Americans who formed the original group of American volunteers fighting against the Japanese. Gladiators were also used to protect aircraft assembly plants at Siuchow. A Gloster Gladiator Mk. I, designated J 8 by the Swedish Air Force. 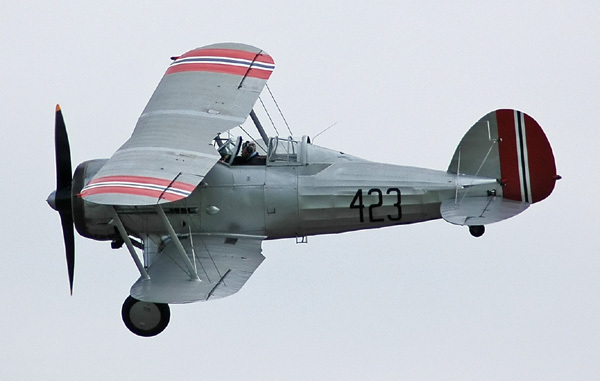 The Swedish Air Force operated thirty-seven Gladiator Is, designated J 8s, and eighteen Gladiator IIs, designated J 8As. Twelve airplanes from this group were the next Gladiators to see combat. 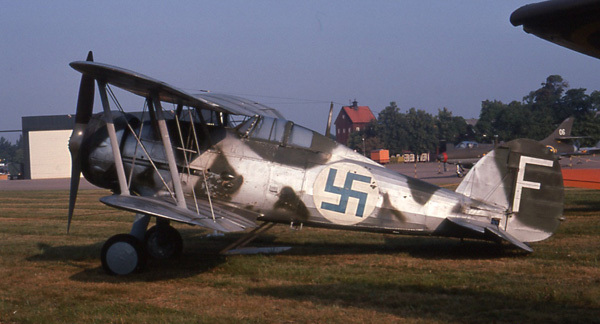 They, along with five Hawker Hart bombers and eight other planes were used by the Swedish Voluntary Air Force to fight in Finland, after it was invaded by Russia. They were commanded by Major Hugo Beckhammar and designated the Floygflottilj 19 and began operations on a frozen lake at Kemi on January 11, 1940. They performed well against Polikarpov I-15s which were slightly inferior and remained in frontline service until being replaced by the Reggiane Re.2000 Falco.5 Thirty Sea Gladiators were sent to Finland and served with the Finnish No. 26 Squadron. Thirty-eight Gladiator IIs were converted and an additional sixty were built at the outset as Sea Gladiators. Differences were an arrestor hook, catapult points, and a fairing beneath the fuselage for a collapsible dingy. Fifty-four Sea Gladiators were still in service with the Fleet Air Arm at the outbreak of the war in September 1939. The Nos.80 and 112 Squadrons fought in Greece and then with Nos. 33 and 94 Squadrons, they fought the Regia Aeronautica in the Western Desert. Fifteen Gladiators were purchased by Iraq and all but five were destroyed by the RAF during the Anglo-Iraqi War on May 2, 1941. The campaign lasted only twenty-nine days and ended with the defeat of the Iraqi nationalists. During the �Battle of Britain�, only one home-based squadron was still flying Gladiators and these were used for the defense of the Royal navy Dockyards at Plymouth. two wing mounted Lewis machine guns. Changed to four Browning .303 machine guns. 1. Owen Thetford. Aircraft of the Royal Air Force since 1918. New York: Funk & Wagnalls, 1968. 246. 2. Robert F. Dorr. Why the P-38 Flunked in Europe. Aviation History. May 2014. 28. 3. Edward H. Sims. American Aces. New York: Ballantine Books, 1966. 90. 4. Francis K. Mason. Aircraft in Profile; Volume 5, The Gloster Gladiator, No. 98. Garden City, New York: Doubleday & Company, Inc., 1969. 4. 5. William Green. Famous Fighters of the Second World War. Garden City, New York: Doubleday & Company., 1975. 187. 6. William Green. War Planes of the Second World War, Fighters, Volume II. Garden City, New York: Hanover House, 1961. 49. 7. Kenneth Munson. Fighters 1939-45, Attack and Training Aircraft. New York: MacMillan Publishing Co., Inc., 1975. 100. Created February 28, 2014. Updated November 9, 1914.